For several years the United States has struggled with housing prices. A South Florida home purchased for $300,000 in 2007 may now be worth $150,000 today. Houses can be found in Detroit for $100 or less. And within the pages of GURPS Infinite Worlds: Worlds of Horror, you'll get six alternate Earths for less than six dollars. 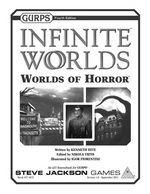 All six of these worlds are presented by fan-favorite author Kenneth Hite, mastermind of GURPS Infinite Worlds and GURPS Horror for GURPS Fourth Edition. Each timeline has an alternate history, information on outworld operations, captivating campaign ideas, and a smattering of GURPS details. Admittedly, for those hoping to take advantage of this remarkable real-estate deal, there may some complications that keep you from moving in immediately: the zombie infestation of Gotha-Z, the vampire lords of Duzakh, the alchemically augmented aristocracy of Gothic-2 . . . typical problems that any prospective property-purchasers might encounter. However, for fans of alternate-historical gaming or unsettling settings, these minor setbacks shouldn't detract from a major opportunity with GURPS Infinite Worlds: Worlds of Horror. Just remember that -- on some Earth, somewhere -- the Chinese character for "opportunity" is the same as the one for "torn apart by inhuman horrors."